God has graciously placed in the hands of the local church which meets at North Street Gospel Hall in Halifax an opportunity to work with a number of landed immigrants and international students. The work began when a Chinese post-doctoral scientist came to Halifax to work for two years at the National Research Council. Through a friend in Ottawa, James was encouraged to call us and ask for help with English. When James made his first phone call he said, ‘I want help with English and I want to learn about God’. Two Christian brothers went to meet him and his wife. They took along an ESV Bible and began, two nights per week, reading with them the Gospel of John at their home. These folks, as is the case with most of the Chinese and Korean people with whom we have worked, can write and read English, as it the official second language in their countries, but are weak in pronunciation. After working with them for about two years, we have moved the program to the Gospel Hall where we conduct classes lasting for two hours on Tuesday and Thursday evenings. We are normally dealing with people who are well educated and who have a good grasp of the rules of English grammar. We also have had students from Russia, Mexico, Columbia, Sri Lanka, India, Uruguay, Egypt, and Iran among others. We believe that one of the most effective ways of teaching English is through the Read Aloud Approach. The student learns as he/she hears the words pronounced correctly by the teacher and further learns through the practicing of proper pronunciation. Each person reads 3-5 verses in turn as we go through a chapter an evening, normally starting with the Gospel of John. Vocabulary is being built as we read together. Comprehension and speaking are fostered as we discuss what we have read. Grammatical issues are discussed as they come up in the reading. Believing that modern, present day English is what is reasonable and required, we have chosen to use the NASB but believe that the classes could be profitably conducted also with either the ESV or NKJV. We want to teach English and believe it is our responsibility to ‘do good unto all men’--‘So then, while we have opportunity, let us do good to all people, and especially to those who are of the household of the faith.' Galatians 6:10 (NASB) We also want to sow the Good Seed of the Word of God. We would like to see fruit for eternity. Can we accomplish simultaneously these purposes? We believe we can. We have seen evidence that God is using His Living Word in the power of the Holy Spirit as per His promise. While many of the people come to us having never seen a Bible, we see evidences that many are seeking for Truth and in the case of the Chinese in particular, would like to learn about the God whom they have been told does not exist. We have decided not to preach in a traditional sense but to present the Word in a reading format and to allow the Spirit of God to use the Living Word. A foundation in the Word must be built. We are teaching, not preaching! We do, however, attempt to explain and share the Gospel from the reading each evening. We are not taking an apologetic approach. When questions arise we take them to verses that show what the Bible declares as the answer to the question. We believe that we can help most by having students read related passages that answer their questions or are connected to the passage we are discussing. From this we elicit responses from the class. We want to be committed to teaching, not telling! A number of us have taken a course in teaching English as a Second Language. A number of these courses are available online. We advertise free ESL classes but the vast majority of our students are brought by other students who are already in the classes. We begin with a light snack and social time. This starts at about 15 minutes before class. This is an important part of the work. Each person is given an inexpensive Bible on their first or second visit. Class sizes are best with a number not exceeding 6-7 as we are contacting them in a discussion format with the teacher sitting down. Each evening all classes do the same chapter but on Thursdays we do a different Bible book than Tuesday. The format may vary slightly depending on the teacher, but we begin with a handout for the class. We attempt to introduce first the vocabulary we will be meeting in the chapter. We then take turns reading 2-3 verses from the chapter. This is followed by discussion based on questions provided on the outline and on questions raised in the class. Having a memory verse that presents the Gospel clearly is very beneficial. The Memory Verse is primarily used as a means of clearly presenting and drilling a Gospel truth. It is difficult to memorize in a language that you are just learning but having each student read the verse aloud and then to try saying it is very valuable. 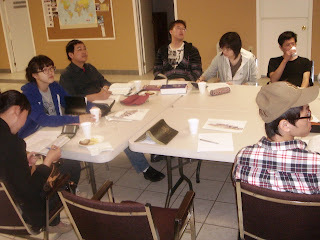 Many students tell us that the Bible knowledge is more important to them than the English. If you would like more information please contact Lloyd Cain, Matthew Cain or David Hull.